The sallet has a faceted skull divided into eight sections separated by raised ridges that taper toward the apex, where they meet in a roped or twisted knop. The knop is threaded and fitted with a crest that is screwed in place. The crest (measuring 3 7/8 x 3 1/2 in., or 9.8 x 9 cm.) is in the shape of a life-size pomegranate, bursting like a ripe fruit with the seeds showing in relief. The reinforcing plate at the brow has a cusped upper edge ending in tiny palmettes. The pointed tail plate has a lobed upper edge studded with rivets; its lower edge, without ornament, is rolled inward. The pointed visor is pierced with two horizontal openings for sight and, below this, a row of alternating slots and circular holes situated above the horizontal axial line. Below this line the visor steps downward in profile and is pierced only on the right side for ventilation, the left being the side that normally received the blows. The upper edge of the visor, which is removable and secured by hinges, is cusped and palmetted, much like the brow plate. The sallet is stamped twice at the back of the skull, near the nape, with a maker's mark: three crowns aligned vertically. 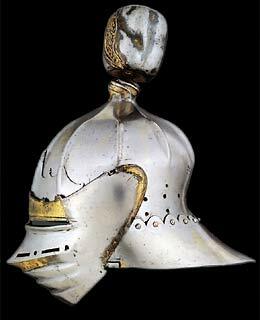 Late in the eighteenth century, it was thought that the sallet had belonged to Boabdil, whose reign as the last Moorish king of Granada ended in 1492. The form of the sallet, however, suggests a Flemish origin that relates it to Philip the Handsome (1478-1506), duke of Burgundy from 1482 and King Philip I of Castile during the last two years of his life. Indeed, the sallet is pictured in the Inventario Iluminado of Charles V among the old Flemish arms and armor, and it is also mentioned among the arms of Philip I in the Royal Armory inventory of 1594: "Una zelada con su media vista y una granada dorada en la cresta y una bavera" (A sallet with its half-visor, a gilded pomegranate as crest, and a bevor). The pomegranate--granada in Spanish--as crest must have been intended as a punning reference to Granada, conquered by Ferdinand and Isabella in 1492. This suggests that the sallet was made for, or soon after, the wedding of their daughter, Juana la Loca (Joanna the Mad), to Philip the Handsome in 1496. 1. 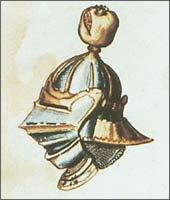 The pomegranate crest, now of steel, was described at the end of the eighteenth century as silver-gilt (Abadia 1793). Abadia 1793, pp. 47-48; Martmez del Romero 1849, P. 16, no 388; Valencia de Don Juan 1898, pp. 143-144, fig. 83.
see how much of the gold has been worn away . I can't agree with you more. The sallet is formed so well as to make it flow gracefully. I think modern eyes will often immediately dismiss this example because of the crest. Nathan, yet again you have managed to find a really cool sallet with some of the attributes of an armet/close helmet! This is really cool, showing some of the evolution from sallet into close helmet in the waning years of the 15th and early years of the 16th Centuries. How Cool! I love the "Grenada" decoration... Philip I is a much-neglected historical figure who's real position as the bridge between the Habsburg dynasty and the Spanish/Burgundian inheritance should be far more renown than it is. By all accounts he was a fine gentleman, and his poor wife, Dona Juana "la Loca" mourned him for the rest of her tragic life. Both of their sons, Charles and Ferdinand, eventually became Emperors, while Charles' son Philip II inherited the crown of Spain, and Ferdinand's proginy claimed the Imperial Seat. But both owed a great deal to their Grandfather Maximilian, as well as their Great-Grandfather Charles the Bold, Duke of Burgundy. However, it was through their father, Philip, that both of these inheritances came together. His marriage to the youngest daughter of Ferdinand and Isabella eventually gained his son the Spanish crown as well. If you want to get into interesting European dynastic trivia, Juana la Loca's sister Catherine was the first wife of Henry VIII of England, and Henry chose a remarkably poor time to request an annulment of that 20-year marriage from the Pope. In 1527, Imperial troops of Charles V (son of Philip I) had sacked Rome and had the Pope under house arrest... and the Pope was wise enough to infer that Charles would be rather displeased to have his dear Aunt sumarily sent packing by this upstart Englishman. Thus Henry started his own church to grant him a divorce in order to marry Anne Boleyn, and father Elizabeth I. Wild stuff, that, and just thought it an interesting foot note to the helmet, since Henry was quite the armour fancier himself. Sorry for the thread necromancy, I was just wondering is there a picture of this helmet taken from the front?